Sandpiper Bay Golf & Country Club, designed by Dan Maples, is a unique 27-hole course geared toward players of all skill levels. It is one of the most high-quality courses in the Myrtle Beach area and features several award winning challenges. Guests are treated to plenty of Southern hospitality so that they feel as though they are being welcomed home rather than just coming and going. A combination of the friendliest staff and best gameplay experience entices players to come back year after year. The course makes use of MiniVerde Bermuda greens that were recently placed after the Club's major renovations. Impeccable standards are a high-priority but the top priority of Sandpiper Bay is the guests. Not more than a 20-minute drive from Myrtle Beach, this course rests in the heart of a lovely and relaxing community known as Sunset Beach. The course compliments the restful town with lovely natural surroundings, well-maintained greens and fairways, and plenty of gameplay fun and surprises. Sandpiper Bay is carved into the awe-inspiring coastline of North Carolina, known to many as the Grand Strand. Natural pine forests helps set the path of the course in order to create subtle doglegs and elevated greens. There are elevated tees in order to present a challenge to avid players while beginners can take their place comfortably on regular tees. However, the regular tees provide a plentiful challenge to low handicappers as well. Despite the relaxing setting, this course will entice players to think about every shot before taking them. This course is a favorite of Myrtle Beach Golf Authority's Golf Director. Could the golf staff be any more uptight and douchey. The food staff was awesome and nice so that is why it gets more than one star. The practice facility is great! With your tee time you get one bag of warmup balls(25 balls maybe?). The range is grass tees and there is a great chipping and putting area also. There is 27 holes here, we played Bay and Sand. The course was in decent condition. It was windy on this day and the course played much tougher. The tee boxes, fairways and Greens were in great condition. The practice green didn't roll anything like the greens on the courses we played. The practice green was lightning quick and the other greens rolled much slower. We will return if we can find a deal for this course. I believe they might overbook tee times so we were about 20 mins late teeing off. The starters staff was great communicating this. What a great day. Sandpiper Bay was in great shape and a challenging course. Its nice and all these nice old people always say hi with there dogs by there sides also there's a nice resetraunt! Well if you must know I didn't order anything but I tried my parents pasta and chicken I would give the food a 4 1/2star rating. Worth it to play here. 27 holes of great golf. Play 18 with a $10 9 hole replay. Wonderful golf course with three nine's. Fairways & Greens in excellent shape. FUN golf course. Nice track with good bones but staff needs training. I am really over the rude staff in the myrtle. It’s the same at all the courses. Surly starters and staff. Please hire some energetic friendly people. There are too many options around this area for golfers to deal with pesky staff. Service service service. No thanks Sandpiper, we will stay at Thistle. In reading reviews, I’m definitely not the only person to complain about your staff. Good luck growing your course with these people. Course is better than ever. The greens are FABULOUS. Course was in good shape. Greens were fast but fair. Would play again. Fairways & greens are in excellent condition. Rates are reasonable & staff are very friendly. Terrific service staff. Good layouts, fairly priced. Always a challenge, but fair. Rates, OK. Highly recommended. Played here on 8-20-18 and again on 8-23-18. Course is in very good condition considering the harsh winter that crushed numerous courses in Myrtle. Sandpipers winter strategy "gamble" paid off, because this course is in way better shape than others we played during the week! Excellent, friendly staff and courteous GM Tim even took 10 mins to intorduce himself. He kindly conversed and asked how we enjoyed our round, and thoroughly explained the work that had to be done on the course to get it in this shape over the last 6 months. This course is currently A Great Experience at an extremely affordable price, thus why we played there twice during our vacation week! 27 holes also makes for a great change by playing different nines each round. Will return! Thank You Tim and your fantastic staff! Played there 2 weeks ago and the course was in great shape other than the 4 temporary greens. Once they get those greens back to par it's a must play. The "beer" lady was awesome. Hope to come back next year with all greens playable. 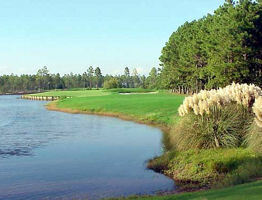 Sandpiper Bay Golf & Country Club, designed by Dan Maples, is a unique 27-hole course geared toward players of all skill levels.